The Frogmarch: So is it hot where you are? Yeah, I already know...it is. 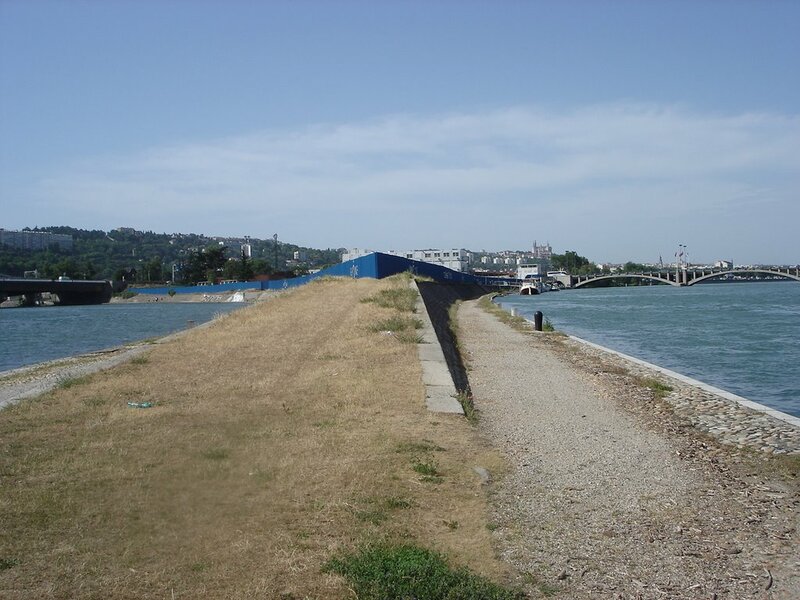 Here in Lyon a "vague de chaleur" brought 90-plus-degree days for several weeks in a row, with no rain since back before Bastille Day. I know, you're thinking that 90+ degrees and 80% humidity is just a late-spring day back in NC, but I gotta tell ya: Lyon is prepared for 90-degree heat like Raleigh is prepared for two feet of snow. Air conditioning as we know it barely exists here. Even movie theaters don't have AC. Everyone habitually overdresses, wearing long pants (and often long sleeves) year-round. Add to that the aforementioned scarcity and expense of deodorant, and you get a Metro that smells like a barnyard (and, as a lesser consequence, people dying of heatstroke because there are no air-conditioned shelters where people can go to escape sweltering apartments). You'd think they would have learned after the 2003 heat wave killed over 10,000 people...well, maybe they have, because there have been only a handful of heat-related deaths this year. Our apartment was of course built in the years before Mr. Carrier's magnificent invention, but with its thick stone walls and courtyard design (allowing a crossbreeze most times of the day), it's not too unbearable. We did, soon after moving in, invest 500 euros in a portable electric AC unit, roughly R2-D2 sized and capable of keeping one large room mostly unsticky. Thus a lot of our time recently has been spent huddled around the ol' AC in the living room. I've heard it argued--probably in the Oxford American--that the advent of air conditioning brought about the demise of the Southern literary tradition: so much depended, apparently, on the front porch and the story-swapping it engendered, not to mention the general misery that fertilizes the flowering of so much creativity. See how much Faulkner suffered when he went to Hollywood to write movie scripts? By that token you'd expect Lyon to be a hotbed of creative activity. But it's quite the opposite: It's a ghost town. In August, most of France is on vacation. I mean deeply on vacation. Many stores are closed for the entire month. Most of the local papers have stopped publication until September, because no businesses want to advertise. Local factories anticipate a huge dropoff in orders and idle their plants, so their workers go on vacation, etc., etc., until there's no one around but the tourists and the businesses that cater to them. And us expats who recoil at the thought of fighting the hordes for a few square centimeters of pebbly beach on the Riviera. I wonder if that's why it's taken so long to get my high-speed internet box delivered. In the meantime I have no phone service at home...so y'all don't be calling me. 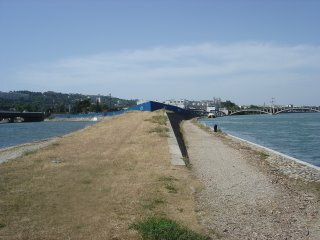 Unrelated pic: The confluence where the Saone River (left) flows into the Rhone (right). (The actual confluence is about 10 feet behind the camera.) This ugly but extraordinarily expensive piece of real estate will soon be the site of a large museum/science center, being built behind the blue fence at center. There's more than just pebbles on display at the beach... there's the cool blue Mediterranean too.